At the moment, thanks to the efforts of environmental campaigners dating from 1978, both parts of Ireland are nuclear free. However, the London government has said it wants just one site for British nuclear waste, and five locations in the north of Ireland are under consideration. 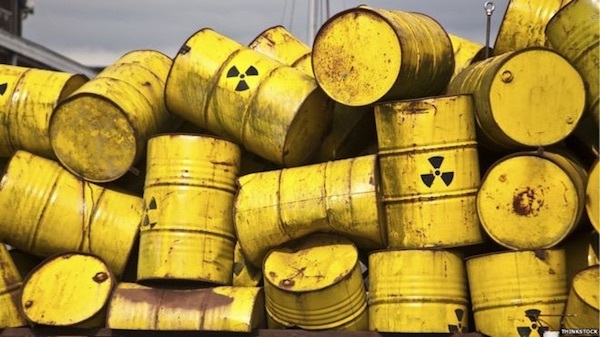 Radioactive waste is currently stored at about 30 sites across Britain, predominantly at ground level at the Sellafield reprocessing plant in Cumbria. Emissions from that extended nuclear complex have in the past been linked high levels of radioactivity in the Irish Sea and clusters of disease in County Louth. Sinn Féin MP for South Down Chris Hazzard said Britain could not be allowed to use the North “as a dumping ground” for its hazardous and toxic waste.